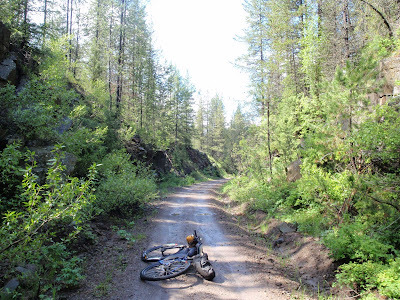 The state of Idaho is short and sweet on the Great Divide Mountain Bike Route - 72 miles and no major climbs. The fast guys probably pound it out before breakfast. The first stop I made in the state was at an RV park just below Red Rock Pass. A photographer flagged me down and offered me a root beer. I asked him if I could borrow the hose at the little camp store. The mud of southern Montana had become so caked on my derailleurs and cables that my shifters had become useless. My "singlespeed" gear that I was stuck with was pretty low and I was spun out on the downhill stretch. The 20 minutes I spent cleaning my bike at the RV park revealed how heinous that mud really was. Even a high-pressure hose wouldn't remove it. I had to use rocks to chip away at the adobe bricks coating my drivetrain. We spent the night at the Sawtell Mountain Resort, and the next day I headed out in steady rain alone to hit the rail trail. 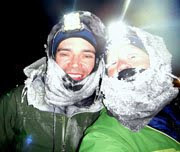 John, who was in full-on tour mode, didn't feel like greeting the cold, wet morning with a slow grind on a soft railbed. He hinted that he'd probably meet up with me later, but maybe not. I thought that was it - I was on my own again, the way I had been in Canada. But a week later, the solitude felt different. This time, I had enough experience behind me to understand the magnitude of the remote, lengthy time alone that I faced. John had warned me that the railbed was was a mixture of sand and soft volcanic ash, and that it would be washboarded and *really* slow. He told me to prepare for 30 miles of grinding away at 4-5 mph. So I approached the trail in "snowbike" mode, mentally bracing myself for the kind of deep slog that only snow and sand can deliver. It's a Zen place where life moves in slow motion and the mind slips into a white state of nothingness to cope with what otherwise can be infuriating monotony. 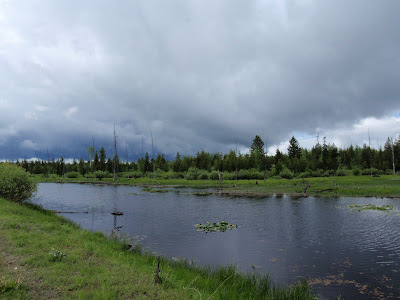 Because I approached the rail trail with this mindset, I was startled to discover that this section of the route even looked like the Susitna Valley of Alaska - with a narrow trail cutting a perfectly straight line across swamps and through stands of evergreens beneath a slate gray sky. A fatigued imagination sparks faster than a fresh one, and it wasn't long before I was deep into an Iditarod fantasy, crunching my way over a vast expanse of white wilderness. The reality of the rail trail, however, was that the buckets of rain that had fallen over the past few days had actually nicely packed down the ash and sand, and I was able to move as fast over the railbed as I could any gravel road, but with less effort, because it was perfectly flat. I finally woke up enough to snap myself out of my slog mindset and start pushing the big gears toward the Warm River. 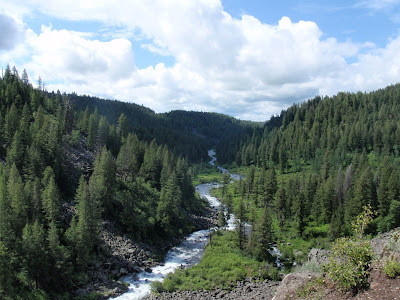 Pretty soon I was winding down a beautiful canyon in a setting that was definitely Idaho. 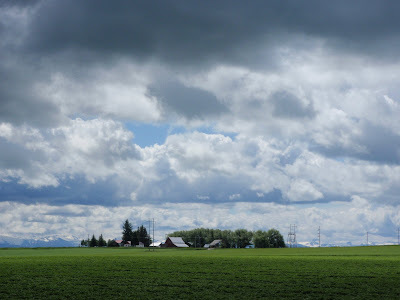 Above the Warm River Campground, I reached the familiar territory of eastern Idaho - rolling farmland set against the snow-capped Tetons. It made me smile because this part of the route was my closest point to home. I lived in Idaho Falls for a year, and still consider Salt Lake City my "home," even if I do live in Alaska for the long term. But being this close to "home" also triggered the thought that this spot would be the best place to quit the race - a mere four-hour drive for my parents to come rescue me from a strenuous life of solitude under the harsh elements. I shook that thought off quickly. I was having a good day, and decisions are always easier to make on good days. John caught up to me near the Ashton-Flagg Ranch Road. 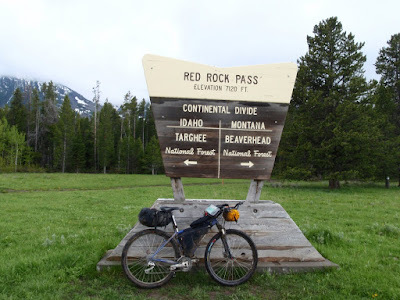 He had decided to hammer the rail trail and put in one more day of Tour Divide fun. 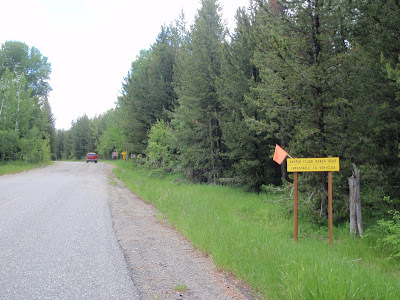 We were greeted by a sign that read "Impassable to Vehicles." The deepening fear of mud pumped cold blood through my veins. Another great write-up, Jill. Are you stopping at every internet cafe on the way to Alaska to produce these? Hey at some point, would you mind sharing some info on how you kitted out your bike? Would love to know what all you brought along with you and have attached. Of course, I'm equally curious on that setup John has, with what looks like an Airstream mailbox on the back of his bike, and some sort of flip-up cowling on the front. Thanks for sharing so much of your adventure in writing and pics. This might be a little too personal, but I'm wondering how one pays for these kind of epic trips. Are they crazy expensive? You're Jill Homer! You have ridden your bicycle from Canada to Mexico! I love that you fantasize about other ultra-endurance races while in the middle of an ultra-endurance race. Congrats on a great ride! Wow very nice place, congratulation! Question: Did you carry some sort of protection just in case you did have to encounter an animal, like a bear or a wolf?